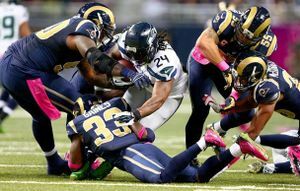 The Seahawks fell to 3-3 Sunday, losing 28-26 to the Rams in St. Louis. Here’s a roundup of media reaction after the game from the national media and major newspapers. The biggest concern facing Seattle’s defense comes at moments in which it had been the most effective in the past. The clutch. It’s when great teams elevate their play. Sunday against the Rams, Seattle closed the deficit to two points late in the fourth quarter. It looked like the Seahawks were going to rip apart any hopes of a Rams victory. But the defense allowed (Austin) Davis to lead an eight-play, 80-yard drive that drained four minutes off the clock and widened St. Louis’ lead to nine points. It was a margin too big for Seattle to close. The final drive was something that would’ve been difficult to imagine happening a year ago. Rule No.1 of punt returning: follow the ball. Seahawks head coach Pete Carroll argued with the officiating crew that (Tavon) Austin’s motion ended the play, but the refs didn’t buy it, giving the Rams an amazing touchdown against a team that rarely allows anything on punts at all. Yes, the (Seahawks’) offensive line is banged up. For a few plays Sunday they were down to their third-team center in Patrick Lewis when backup Stephen Schilling left the game briefly in the second half. And left tackle Russell Okung is playing with a labrum tear in his left shoulder. Even so, the offensive line isn’t playing well when all the starters are on the field and healthy. It appears to be a problem that isn’t going away anytime soon, but Wilson remains optimistic after another game in which he had to improvise to try to stay upright..